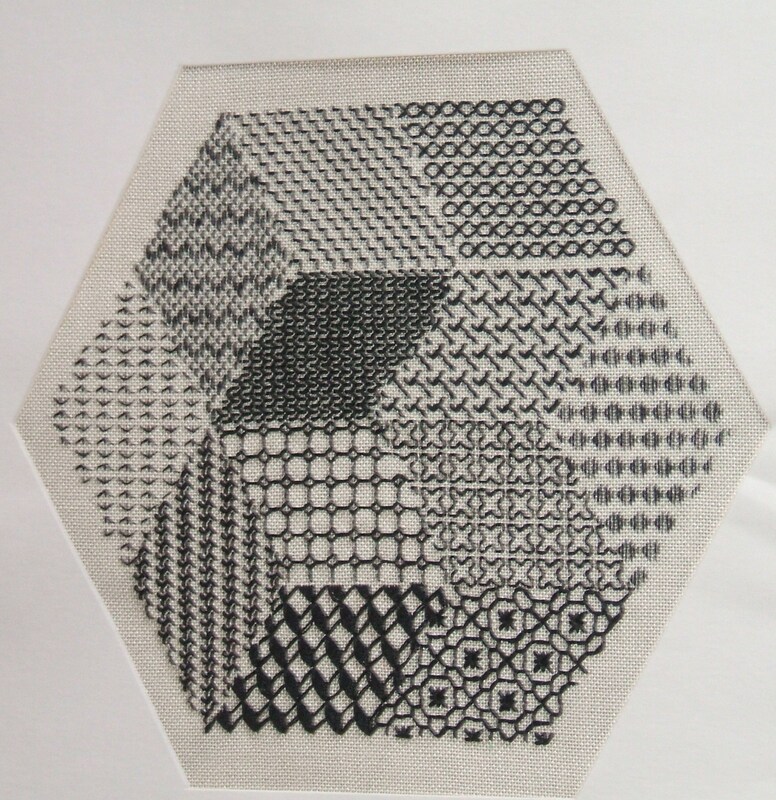 BLACKWORK is usually described as counted thread stitching worked in black thread on a white or natural background of evenweave fabric. 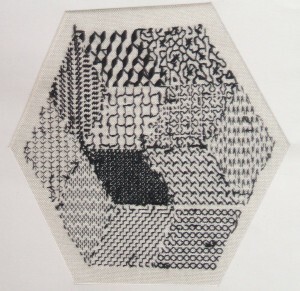 Part of the fascination of blackwotk is forming repeating patterns with varying density. 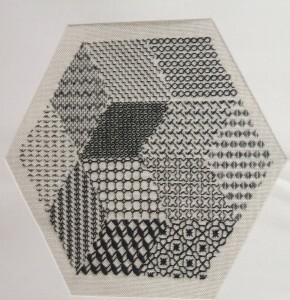 Before beginning any stitching it is a good idea to sketch out various patterns on graph paper filling some of them in. You might prefer to have greater density of stitches at the bottom, in the middle or around the edges of an area of pattern. Inspiration for blackwork design can be found in tiles, wrought iron gates and railings, old manuscripts and even from nature such as winter bare branches or skeletal leaves. 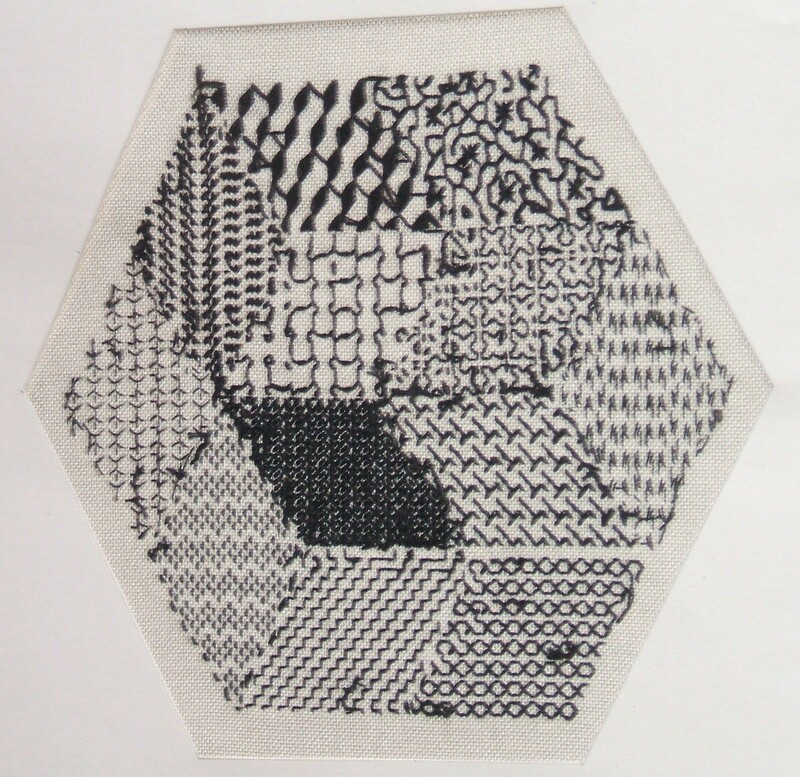 For my sample below I used newsprint cut in diamond shapes and the density of the print dictated the stitches used for each section. Now the experts will tell you that I don’t have the balance right in this piece, but it will give you an idea of the effect and the stitches used. Whenever possible, try to bring the thread from the back to the front of the work through an empty or unstitched hole of fabric and down through a filled one that has already been worked. This should prevent the embroidery threads splitting which tends to result in messy definition between one stitch and another. A blunt tapestry needle is best and the work can be worked in an embroidery ring or hand held. This entry was posted in Crafts on February 24, 2010 by Grannymar.